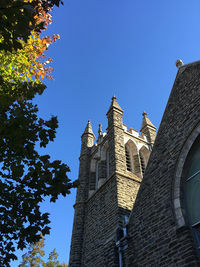 Oak Lane Presbyterian Church (PCUSA). The Oak Lane Presbyterian Church, organized in 1891, has been located at 11th & Oak Lane since 1902. Our church family is known for its warmth and friendliness and is blessed with a unique blend of ethnic backgrounds. If you have no church home in this community, we invite you to make Oak Lane Presbyterian Church your church home. Our hope is that you will share our faith in Jesus Christ – in song, prayer, and fellowship. We are located at the southeast corner of 11th Street and Oak Lane in Philadelphia, three blocks east of Broad Street and one block north of 66th Avenue. This page was last edited on 12 December 2016, at 21:39.